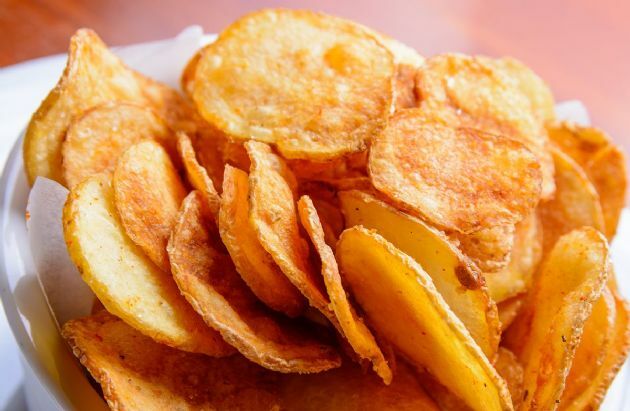 You'll never believe these sweet and crunchy chips were made in the microwave. They'll become your new favorite savory snack. You'll never believe these sweet and crunchy chips were made in the microwave. They'll become your new favorite savory snack. I prefer to use free-flowing salt, which is finer than table salt. If you don't have any, place regular salt in a clean coffee grinder and pulse until it is powdery. Microwave ovens vary, so stick close and adjust the time as needed. Feel free to change up the spices or seasonings. Cinnamon, nutmeg, cayenne pepper, or rosemary will all work well with these chips. Use a knife, the slicing blade of a food processor, or a mandoline to cut the sweet potato into 1/16 inch slices. Place the slices onto paper towels and pat dry. Place a sheet of parchment atop a microwave-safe plate. Layer the potatoes on the plate, taking care not to let them overlap. Mist the potatoes with cooking spray, then sprinkle the chili powder and salt over the potatoes. Microwave on high for five minutes. Let the potatoes rest for one minute, then cook for another four minutes. Remove any chips that are light brown and cook the remaining chips, if necessary, for one more minute. Repeat with the remaining potato slices, using more parchment. Cool completely before storing in an airtight container. OVEN INSTRUCTIONS: Bake for 20-30 minutes (or until they reach the desired crispiness) at 450 degrees F on a baking sheet lined with parchment or atop a wire rack.